As a member in good standing and the president and founder of The Society of Gardeners Aged 50 and Over (SGAFO), I bring before you a petition for the proposed membership of my baby sister who turns 50 years old today. Let's call her Sherry. Sherry's qualifications include first that she is my sister and secondly, of course, that she also gardens. Oh, and did I mention she is 50 years old today? I would describe her gardening style as both kid friendly and pet friendly, where weeds often hide various dog and kid toys left out and about and kids are encouraged to help plant, though as they get older, they seem less inclined to assist. She likes what I would characterize as a cottage style of gardening, which works well to hide the weeds. Her choice of flowers is rather eclectic and includes many passalong plants from me, her generous, giving, and gracious gardening sister. 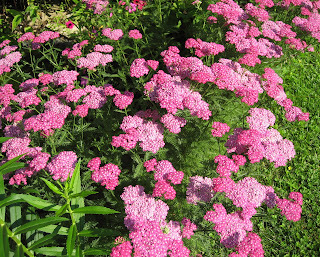 She also buys plants of her own choosing including the pink yarrow, pictured above. Yes, she does favor pink flowers over other flower colors, I believe. In the spring, I can always count on her to call and ask me in late April if it is too early to plant annuals and tomato plants. I always answer yes. Some years she plants them anyway, and it works out just fine. Other years, she plants them anyway and they get nipped by a late frost. It seems like she is intent on planting in late April, regardless of what I say. I realize that this may actually disqualify her from SGAFO, but it is a fun story to tell. As a new member, Sherry would, of course, be subject to the same initiation proceedings that all other members endure, even though she is related to me, your humble president. In summary, overall, I believe she has met all of the qualifications that I have set forth, including that all important qualification of being at least 50 years old, and therefore should be accepted for full membership in the society. It would be a wonderful birthday present for her. As a member in good standing (except when my knees hurt from too much gardening and I have to sit for a spell) I vote 'aye'. Just be sure to follow procedure. No going easy on her just because she 'knows people'. I hereby second the aye to accept Sherry into SGAFO. I wish her many years of gleeful cottage blooms in the garden of life with or without the help of the children, with or without the adivce of her, ahem, elder sister. It's ok w/me. I like pink flowers, too, especially when they hide weeds. As a member in good standing I also vote to admit her. The more the merrier. Yes, from the back of the room! I think Sherry and I have the exact same gardening style, so I vote to admit her. Maybe we'll make her Sergeant-at-Arms so she can tell the President when she's out of line. Welcome, Sherry! I also love pink flowers that hide weeds. Remember, Advil and knee pads are two of your best gardening tools! Wishing many happy gardening days to Sherry! Carol, one of my gardening cousins also turned 50 today & I think she reads your blog. Maybe you'll get another application today? Happy birthday to your baby sister and happy New Year to all of you. May she and the rest of us have many joyful years of cultivating wonderful flower gardens. Also a member of the SFAGFO, it can be a challenge but keeps us going. It's been a while since I visited, but I'll be back.